Tufts Labor Coalition’s (TLC) Public Forum last Friday, March 27 brought a large crowd to Braker Hall 001 to challenge Tufts’ proposed cuts to the janitorial budget. Students, janitors, parents, alumni and administrators gathered at 2:30 p.m. to share their opinions, demonstrate their opposition to the proposed cuts and show their support of the janitors. TLC organized the forum as a response to Tufts’ plans to cut part-time workers from the janitorial staff. The forum was intended to give all members of the Tufts community a chance to speak for themselves, according to TLC President Lior Appel-Kraut, a sophomore. TLC and Tufts administration made the decision to hold the forum in December as a result of negotiations between the two parties, Executive Vice-President Patricia Campbell said. Vice President of Operations Support at DTZ Inc. John Kennedy explained that the plan would cut 35 workers from the part-time faculty and have an impact on the hours and working schedules of an additional 56 employees. TLC member Cynthia Guerra, a senior, opined that sustainability and cost efficiency should not take precedence over job preservation. She emphasized the severe consequences that job losses or re-allotments of hours could have on the people involved. Guerra further argued that that the workers who would have their jobs redefined instead of eliminated may still face economic and employment challenges because of the new hours. “This will force more people to quit their jobs,” Guerra said. Many of the part-time workers employed by DTZ at Tufts have second jobs in other locations, she further noted. If DTZ changes workers’ hours they may face scheduling conflicts that impede their ability to maintain other commitments. Kennedy explained that in an attempt to alleviate the negative effects of layoffs, DTZ would initiate a hiring freeze at its other Boston locations. If any positions there become available, former Tufts workers will be given preference for those positions, he said. Guerra countered that these alternative positions were not guaranteed and were likely to be temporary or seasonal employment. Many other event attendees spoke out against the proposed cuts. Service Employees International Union (SEIU) Local 32 BJ District Director Roxana Rivera said the new plan frustrated her because SEIU has been working for the past 12 years to improve wages and industry standards for custodians, and she worries that these changes would undo much of that work. Tufts’ decision to cut workers will have an impact on its relations with the larger Somerville community, Tufts alum and Somerville Alderman Matthew McLaughlin said. He shared his own story as the son of janitors in Cambridge and stressed how important his parents’ ability to maintain employment had been in his family. McLaughlin added that if Tufts continues to pursue these cuts, he will be hesitant to support Tufts’ requests to the city in the future. “Anytime Tufts comes before us with their payment of taxes, which is insignificant compared to what MIT and Harvard contribute to Cambridge, anytime they need an event permit … I am going to question that,” McLaughlin said. TLC member Arismer Angeles, a first-year, argued that public and student support would be necessary to change the Tufts administration’s position on the cuts. Professor of Physics Gary Goldstein, who has vocally supported the janitorial staff since the first cuts were made in 1997, agreed that students needed to make their grievances known in order to capture the attention of the administration. The janitors themselves also spoke on their own behalf at the forum. Paula Castillo, a DTZ employee, made a statement on behalf of all the janitors in attendance. 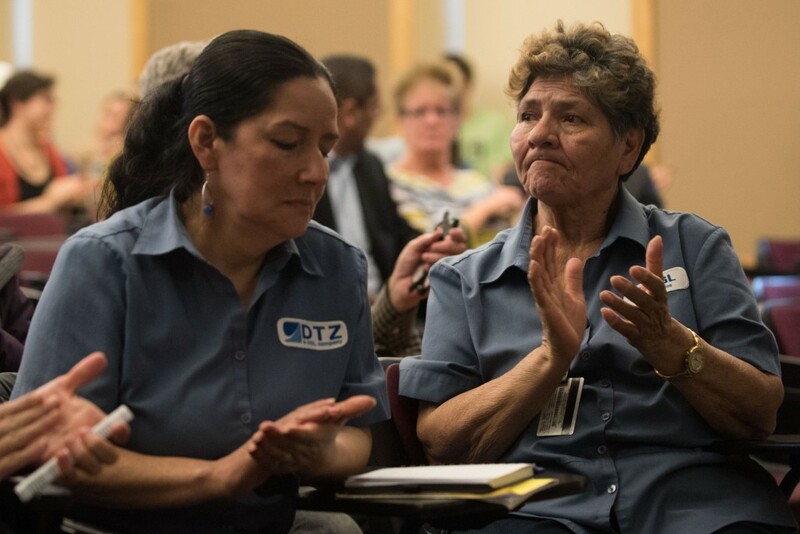 Lorena Narita, a fellow DTZ employee, appealed to Campbell and Vice President of Operations Linda Snyder as mothers. Narita also delivered her statement in Spanish, which an interpreter also translated into English. “If you were going to lose your jobs at this moment, as a mother are you concerned about your kids’ dreams?” Narita said. Narita also asked Kennedy and DTZ to consider the human impact of their decisions rather than just monetary gains or practical needs.